For us, it was part road trip and part reconnaissance mission. We’re on the hunt for our next place to move. While Chattanooga is still at the top of our list, Savannah surprised us. It’s charming, historic, beautiful, friendly, and right on the water. And all those things that make it a great place to live naturally make it an awesome place to visit. By the numbers — less than 150,000 Southern souls spread across just 100 square miles — Savannah is a small city. And the downtown core is only a tiny fraction of that. It’s perfectly walkable, especially for out-of-towners without a car. Of all the things to do in Savannah GA, these are our favorite places to eat, play, and stay. Situated in the century-old Scottish Rite building, Gryphon is quite a romantic, date-worthy lunch spot. The intimate elegance of the interior, where white-clothed tables, carved-mahogany bookcases, and original stained-glass panels convey warmth and graciousness, provides a front row seat to the iconic Bull Street. 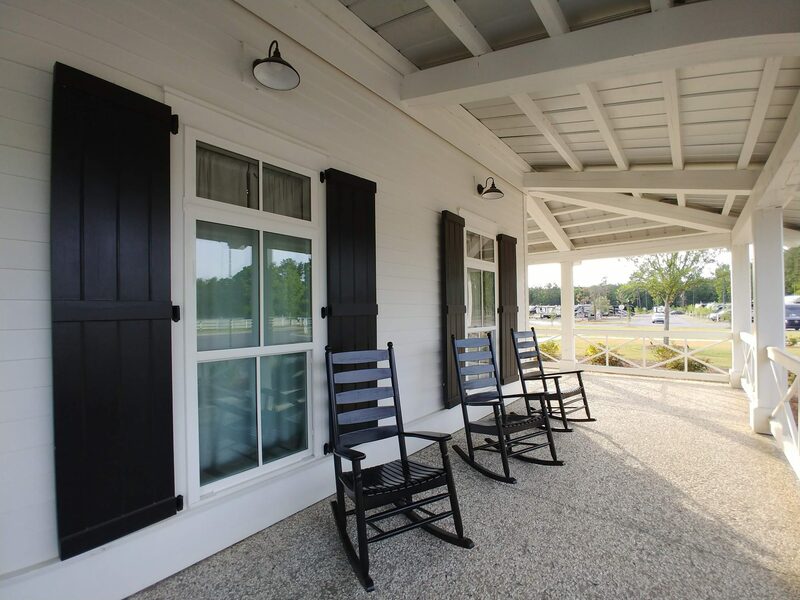 The focus is on organic, locally sourced Southern cuisine. For cocktail hour, Top Deck Bar is a rooftop bar that deftly balances “swanky” and “relaxed” with a healthy dose of amazing views of the Talmadge Memorial Bridge, the Savannah River, and historical Bay Street. Service at Cotton & Rye is dinner-only. But, the food is so damn good, it’s worth the all-day wait to eat there. While it occupies a mid-20th-century bank building, the vibe is mostly relaxed and slightly chic with plenty of Southern charm. The menu runs the gamut from house-made sour corn succotash to Carolina trout to shrimp & grits. Be sure to ask for a seat on the outside terrace. If things start to wind down too much, head to The Rail Pub. Situated in a century-old building (isn’t everything in Savannah? ), this dive bar is a Savannah institution with plenty of indoor and outdoor space to keep the party going well after midnight six days a week. Along with plenty of beer and house cocktails, you’ll find Southern delicacies like pigs’ feet & pickles. Few cities nail the beautiful-spooky-historic-Southern-Gothic vibe like Savannah. Charleston aside, few cities nail the spooky-historic-Southern chic vibe like Savannah. While a simple stroll around the city presents countless Instagram photos like the ones in this post, the best place to get a feel for the city’s Southern Gothic vibe along with a healthy dose of history is Bonaventure Cemetery. It’s consistently ranked among the most beautiful cemeteries in the world, and with good reason. Not surprising then that it’s appeared in countless Hollywood movies like Clint Eastwood’s Midnight in the Garden of Good and Evil. 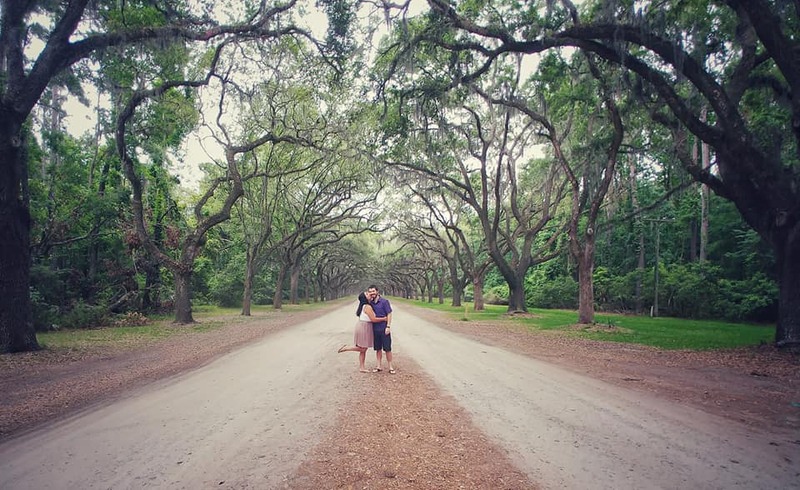 It’s 100 acres of idyllic rolling hills dotted with centuries-old live oak trees covered in Spanish moss. Plan one hour for a quick peek, but I would allow two hours to tour it all and have plenty of time for photos. Bonus: it’s free. 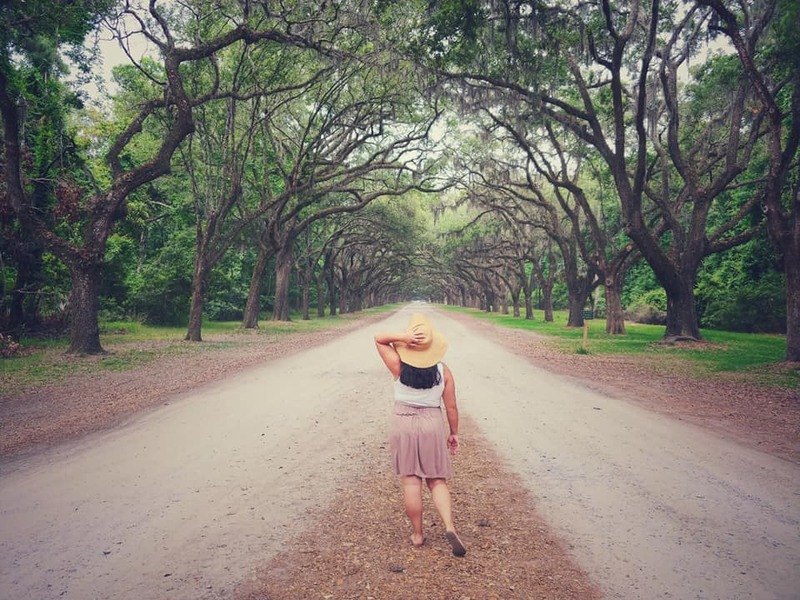 Wormsloe Plantation might be tied with Bonaventure Cemetery for the most popular and most Instagram’d attraction in Savannah. 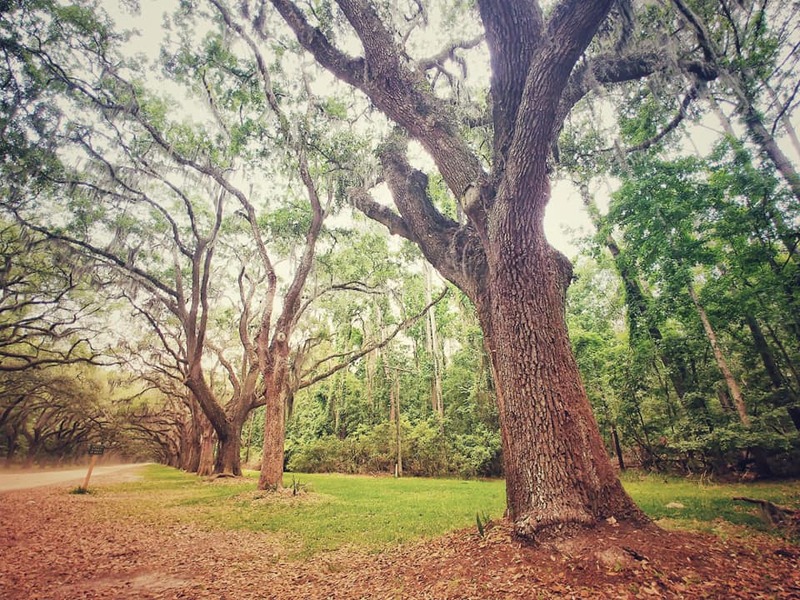 Upon entering, you’re overwhelmed with a breathtaking, mile-and-a-half-long avenue sheltered by live oaks and Spanish moss leading to the 18th-century tabby ruins of Wormsloe — the oldest standing structure in Savannah. Looking for more things to do in Savannah GA? Take a stroll down Broughton Street. It’s the city’s main strip, where you can while away an afternoon of eating and perusing. Byrd’s Cookies is an iconic dessert shop that dates back to 1924. Be sure to grab a tin to go. Also on Broughton Street, Savannah Bee Company got its start in — wait for it … — Savannah, Georgia. In the twenty years since the company’s launch in 1999, it’s turned into a global brand. We love it not only for its amazing honey-centric products (grill honey, anyone?) but also for the worthy causes they support like The Bee Cause Project. Lastly, do the River Walk. For all the right reasons, everyone will tell you to steer clear of this undeniable tourist trap. Make no mistake: it is an absolute tourist trap. It’s full of taffy shops, overpriced restaurants, and souvenir tchotchke peddlers. But, it’s an accurate snapshot of the city’s waterfront district and, even on a rainy day (and we had many), it provides a lovely photo backdrop. As y’all know, chain hotels aren’t usually our thing. 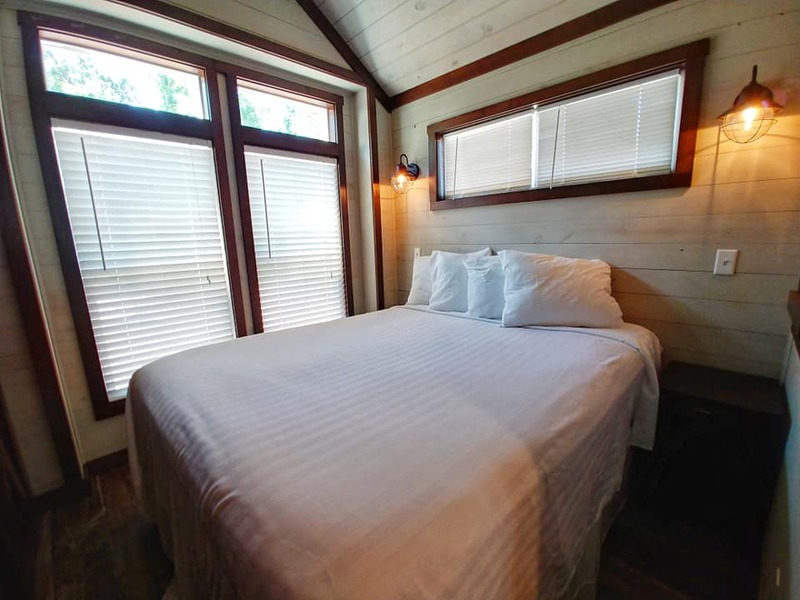 We’ll take a boutique hotel, Airbnb stay, a sweet campground, or even a treehouse over a Holiday Inn or even a Four Seasons any day of the week. Thankfully, in addition to all the great things to do in Savannah GA, there are plenty of great places to stay (a surprising number actually, given the city’s tiny size). 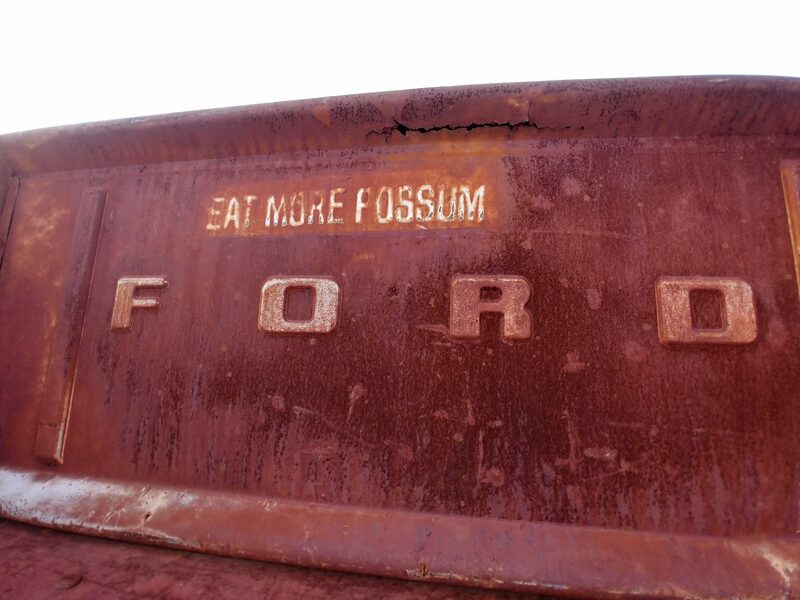 When we stumbled on CreekFire Motor Ranch, we were ecstatic. It’s billed as a luxury campground, but that’s quite an understatement. When we arrived, we found it to be a legit resort. Even though it opened in October 2017, it’s expanding at a lightning pace. There are plenty of primitive campsites, plus more than 100 RV sites with full hookups. So campers of all variety can find their perfect place to crash. 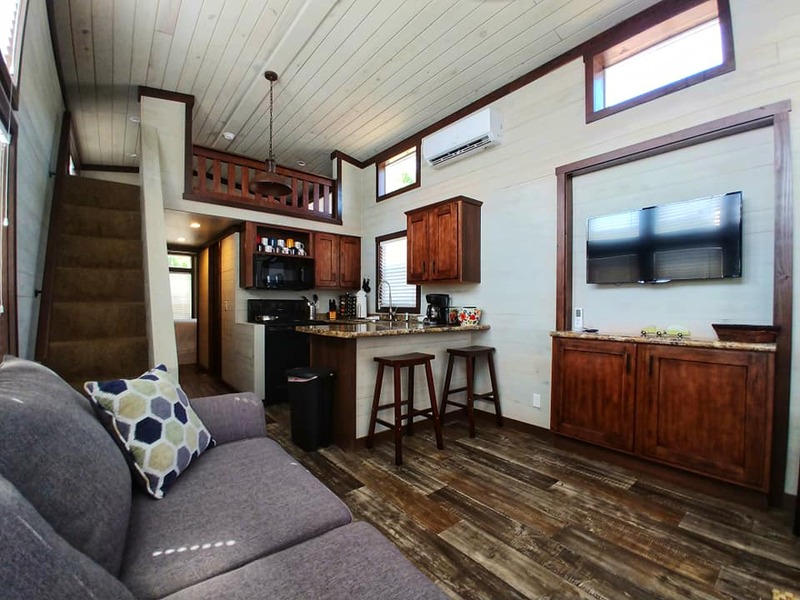 For us, the big get was to snag one of their “cabins.” I use that term loosely because the cabins are actually upscale, tiny-house-like accommodations. 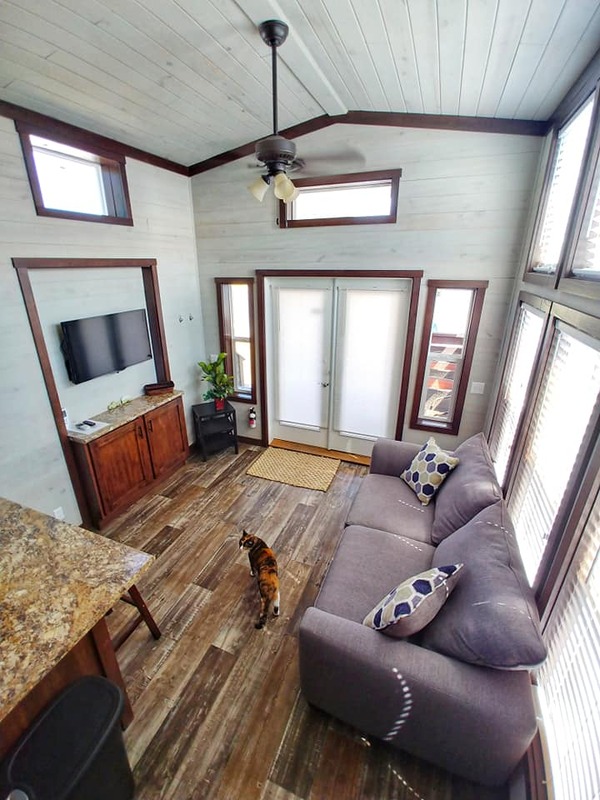 Our 400-square-foot cabin (cabin #1) featured a full master bedroom, a cozy kitchen with full-sized appliances, a full bathroom, a spacious living room with a giant TV, and an upstairs sleeping loft. 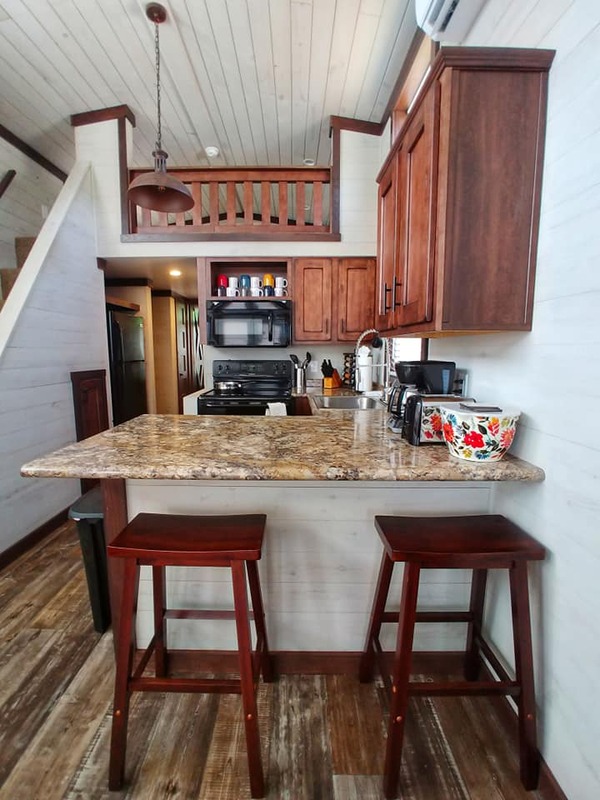 All the cabins at CreekFire Motor Ranch also feature a private deck overlooking a pristine lake, and a secluded backyard fire pit area. Plus, they offer all the bells and whistles you’d find at a traditional hotel: Wi-Fi, satellite TV, coffeemakers, and they’re pet-friendly which was obviously a huge plus or us. It was enough to coax us to stay inside most days! 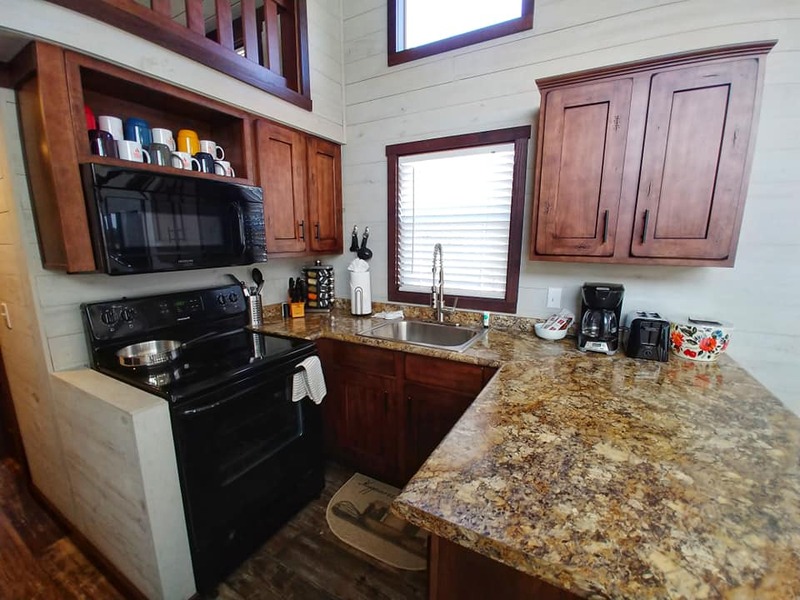 If you manage to pull yourself away from your cabin or tent site for a few hours, the ranch is packed with resort-like amenities. 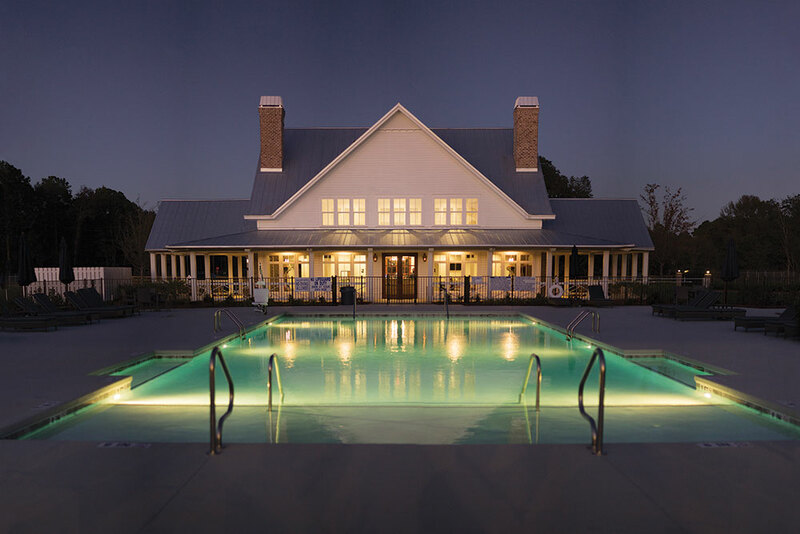 There’s an outdoor pool, a lobby game area, a club area (with a basketball court, tennis courts, and a playground), a one-mile nature trail around the property, and fishing, kayak, and bike rentals. There’s already a boatload of additional amenities in the works for 2018: a lazy river (! 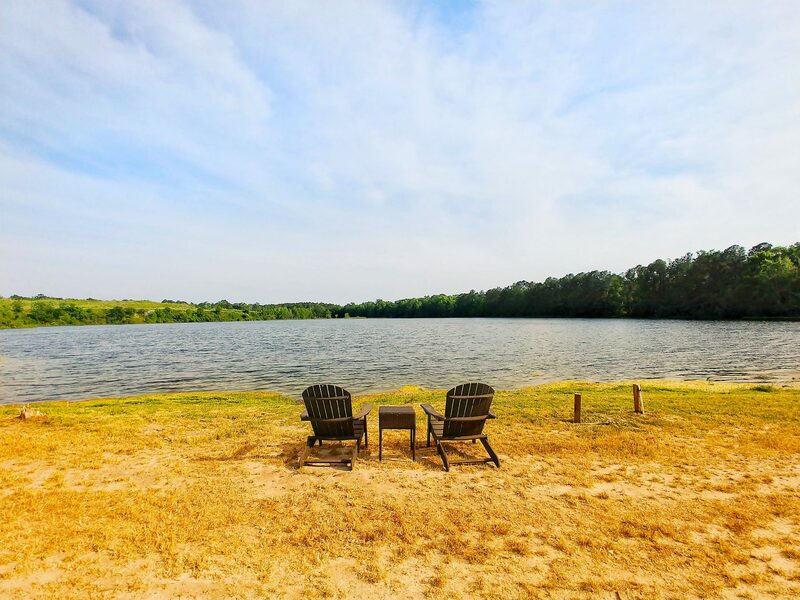 ), a sandy beach, and a full lake house with a lounge, restaurant, and covered waterfront bar. When you’re ready to explore all the great things to do in Savannah GA, there’s even reasonably priced shuttle service to and from downtown. 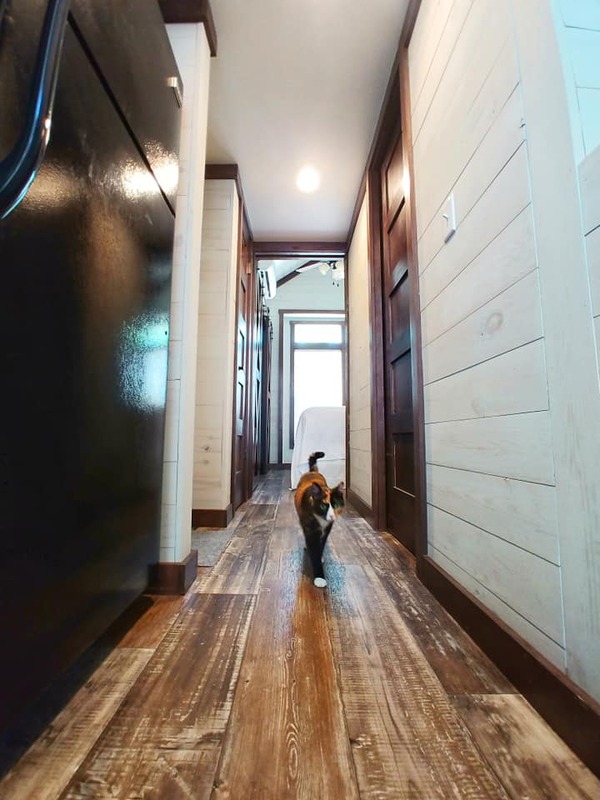 The Brice: A Holiday-Inn-turned-boutique-hotel, The Brice is fun, comfortably chic, and pet-friendly. The free nightly wine hour and great people-watching along the boardwalk are bonuses. Marshall House: For sheer historic Georgian charm, you can’t beat The Marshall House. As the oldest hotel in Savannah, it’s ideally sitated in the city’s Historic District, and offers vintage details like high ceilings, decorative fireplaces, and hardwood floors. What are your favorite things to do in Savannah GA? Let us know in the comments! The post Things to Do in Savannah, Georgia: Where to Eat, Play, and Stay appeared first on Vagabondish.